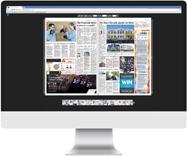 Welcome to the Otago Daily Times e-edition website. For subscribers we provide a digital version of the physical product available on iPad/iPhone, Android and Desktop (this website) (sample edition). Stay up to date by taking the local news with you anywhere in the world by activating your subscription for digital access. These apps have been designed specifically to deliver a clean reading experience. Your editions are downloaded so they can be read offline while travelling. Get it for free on the App Store. The e-edition on desktop represents the newspaper as a true to life flip edition on screen experience. The system supports modern HTML5 or Flash based browsers. Try the sample edition below to see. The e-edition on Android has been designed to run on a wide variety of manufacturer's hardware (including some phones). Editions are downloaded to your device so they can be read offline while travelling. Get it for free on Google Play. Your subscriber number is located on your statement. Please enter your name as shown on your latest statement. Please enter the street number and street name at which your newspaper is delivered. Please use your personal or home email account where possible. An activation email will be sent to this email address for confirmation. Account registered successfully and ready for confirmation. Thank you for registering for the Otago Daily Times e-edition and providing your subscription details. A confirmation email has been sent to the supplied email address. This email contains a link to activate your account. A password recovery email has been sent to the supplied email address. Please follow the link to set a new password for your ODT e-edition account.